2017 Update: 4 Ways You May Be Killing Your Predatory Mites, and How to Check! In 2017, I had an interaction with a grower where their long-standing biocontrol program for thrips suddenly seemed to be failing. After a (too long) investigation by myself, the grower, and consultants, we found out the horrible truth: their predatory mites were being MURDERED (Duh dun DUHNNN! )… By improper storage. This post focuses on all the ways YOU might also be guilty of mite murder, and how to make sure your mites are still alive and kicking in those little sachets. Well, now that I’ve gotten your attention, let’s be clear that I’m talking about bugs, here, people. Specifically, Western flower thrips and predatory mites such as N. cucumeris and A. swirskii. Second instar (L2) western flower thrips next to a predatory mite egg (left) and 2 adult mites (right). Photo credit: Sarah Jandricic. We all know that predatory mites only kill and eat the small, first larval stage of thrips (referred to as L1’s). Larger life stages (i.e. L2’s and adult thrips) are simply too large for the mites to kill. But, that doesn’t mean they don’t help control them. Predatory mites will repeatedly attempt to kill L2 thrips – attacking them up to 40 times an hour (1). The L2 thrips are able to fend off these attacks by either running away, or “slapping” mites in the face with their abdomens. You can watch the hilarity that ensues when mites attempt to attack too-large thrips larvae here. But this “harassment” by mites takes it’s toll on thrips. 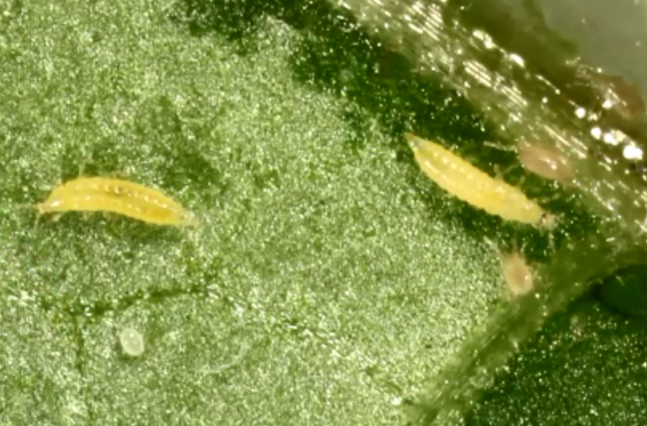 Because thrips spend more time fending off mites, they spend 30% less time feeding (2). Over time, this translates to 40% less damage on plants with predatory mites, compared to no mites (2). And, the presence of mites can reduce survival of L2 thrips by up to 78% (1), probably because eating less means the thrips lack the nutritional reserves to complete development. And all of this is accomplished just through “intimidation” of thrips by mites – not through consumption. Scientists term these “non-consumptive” effects, and we are just starting to learn the importance of these effects in biological control. Research is now suggesting that non-consumptive effects like “harassment” may actually account for 50% of the pest control we see in greenhouses (3). This makes sense with our thrips example. Not only do mites reduce the feeding and survival of larval thrips, but ongoing research from Cornell University shows that the presence of mites reduces the number of eggs laid by adult thrips, and shortens adult thrips lifespan (4). Even the presence of predatory mite eggs on a plant has been shown to “scare” L1 thrips into eating less, according to research from Austria (5). And, it would make sense that the more mites you have, the higher the number of “scary” encounters thrips will have with them, improving control. So, lets give a hand to the hard working, harassing, predatory mite, who’s doing more than we ever thought in floriculture IPM. Stay creepy, little guys. Stay creepy. References: (1) Jandricic, S.E., Schmidt, D., Bryant, G., and Frank, S.P, NC State University. Unpublished data. (2) Jandricic, S.E. and Frank, S.P. 2014. Too scared to eat: non-consumptive effects of predatory mites. IOBC/wprs Bulletin 102: 111-115; (3) Preisser, E. L, Bolnick, D. I., & Benard, M. F. 2005: Scared to death? The effects of intimidation and consumption in predator-prey interactions. Ecology 86: 501-509. (4) Loughner, R., and Nyrop, J. Cornell University. Unpublished data. (5) Walzer, A., & Schausberger, P. 2009: Non-consumptive effects of predator mites on thrips and its host plant. Oikos 118: 934-940.